Northeast Whitewater: Moosehead Lake Adventure Destination: Summer Adventure in Moosehead Lake! Summer Adventure in Moosehead Lake! With school coming to a close for the summer it's time to start planning your vacation! Why not Come to beautiful Moosehead Lake, Maine. It's the perfect setting to relax and unwind. After unwinding for a bit it's always time for adventure! The best adventure being whitewater rafting with Northeast Guide Service. Take an exciting ride on the Kennebec River, or if your looking for something more challenging take a rafting trip with us on the Penobscot River or Canada Falls. If your thinking about camping during your vacation, we also offer overnight rafting trips every weekend! Northeast Guide Service also offers scenic waterfall hikes. 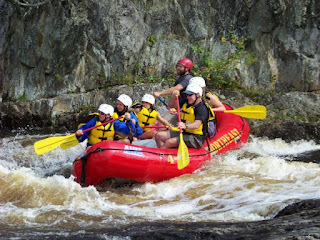 Visit our website at www.rafting-maine.com for more info on planning your summer vacation.